Godolphin's great start to the season continued as Sudden Wonder edged out Observational in Newmarket's £200,000 Tattersalls Millions 3-Y-O Trophy. 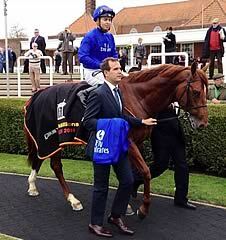 Trainer Charlie Appleby won two similar contests last season with Wedding Ring, and Sudden Wonder brought some smart maiden form to the table having raced against fellow Godolphin inmates Outstrip and Pinzolo. Racing on the far side, Sudden Wonder took up the running entering the dip but Observational soon joined him and the pair enjoyed a ding-dong battle in the final furlong, with Mickael Barzalona's mount prevailing by a head. Roger Charlton will be thrilled with Observational, having just his second start, while similar comments will apply to William Haggas and the third home, Seagull Star. However, the favourite, Aidan O'Brien's Johann Strauss, was well beaten and remains a maiden despite finishing second in the Racing Post Trophy. The race was delayed by around 10 minutes after Richard Hannon's Shafrah escaped from under the stalls and completed the whole course with his saddle under his belly. Appleby said: "I thought he came into this season with a nice two-year-old profile and I ran him in this race rather than a Listed race because I wanted him to experience a bit of hustle and bustle and learn a bit more. "He's a big, raw horse. There are really no goals, he is entered in the Dante Stakes, that might be aiming a bit high but we'll take a look at some of the trials and see how he comes out of the race."